East Tyrol has a long tradition of via-ferrata, called “Klettersteig” in the local language, that combines rock climbing, high wire climbing and hiking items. On the route a steel cable is fixed on the natural rock for the hiker to hang on with his carabiner, for ensuring himself, ladders, bridges and artificial catches help to go on the way. These routes were not made for professional rock climbers, but for hikers who are looking for challenges in the mountains. An unforgettable experience for everyone, children and adults alike, as we can be a rock climber and get up the passes and peaks which would otherwise be inaccessible. Anyone who wants to start on the via-ferrata routes should have the proper equipment and experience or have a local guide to lead, to start conquering the rock walls! The surrounding area has many via-ferrata trails, on different levels from easy to difficult, grades A-E, along mountains and streams, everyone can choose the right route for one’s interest, skills and strength. We can provide equipment and qualified tour guide for the via-ferrata tours through our partners. 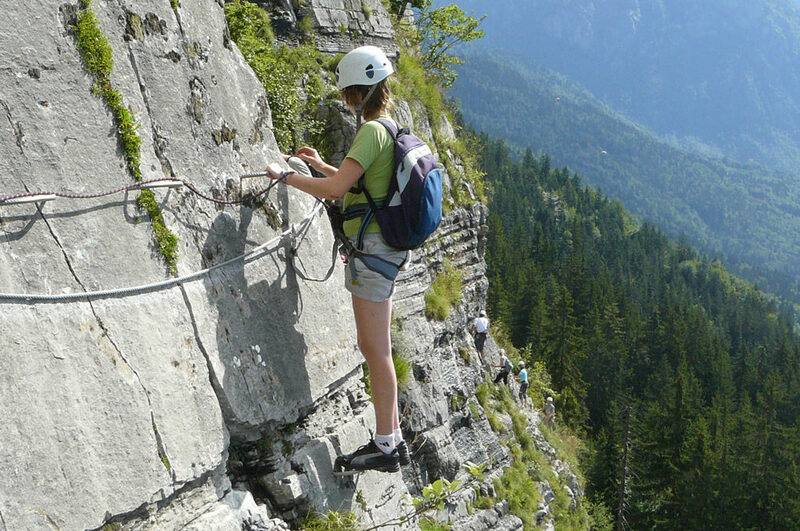 For trying via-ferrata, you may want to go to the Galitzenklammi Adventure Park, located next to the Lienz in the Dolomites, where we can try via-ferrata on two different routes, an easy and a difficult one. This route can be reached from Matrei, the part of via-ferrata is 45 minutes, the difficulty level is D.
This route takes us up to 3164 meters, the part of via-ferrata is 30 minutes, the difficulty level is A/B. This route takes us up to 3206 meters, the part of via-ferrata is 1 hour, the difficulty level is B.